Sammy Donnelly wants Shoreham to learn from their mistakes after the club’s winless run was stretched to five matches last night. Mussels made a flying start to the campaign, winning three of their opening four games but have not tasted victory in nearly a month. A home SCFL Premier Division defeat at the hands of highly-fancied Horsham YMCA on Saturday was followed by a 2-1 Peter Bentley Cup second-round loss to league rivals Lingfield at Middle Road four days later. Donnelly is not concerned despite a run of five games without a win, but wants his team to learn from the recent defeats. He said: “We were beaten by the better team in Horsham YMCA on Saturday. Again, we had chances in the game. We need to learn that if we’re not going to win a game, we just need to try to get something out of it. “No team likes losing matches and we’re the same. We’ve shown earlier in the the season what we are capable of when we really turn it on, it’s just a case of finding some consistency. Goals from Anthony Nwachukwu and Dean Bown in the final 30 minutes took Horsham YM to a 2-0 win over Mussels in Saturday’s league game. Shoreham did have chances in the game but were not clinical, with high-flying Horsham making them pay. Donnelly missed the Peter Bentley Cup second-round defeat at the hands of Lingfield. Sammy Clements and Blake Pickett struck in five second-half minutes to put Lingers in command. Andrew Dalhouse pulled one back 14 minutes from time but Mussels were beaten 2-1. Shoreham have been without injured defensive duo Harvey Dunk and Josh Tuck and Donnelly feels the pair have been a big miss. Both are expected to be missing for at least the next couple of weeks, with Mussels boss Donnelly seeking replacements in the short-term. He added: “I’ve lost my two centre halves and that really hasn’t helped us over the past few weeks. 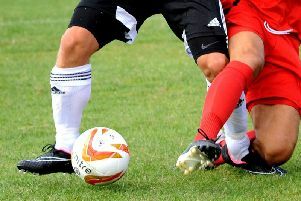 Mussels will be hoping to score a first win in six matches when they make the trip to newly promoted Langney Wanderers in the league on Saturday. Wanderers, who play their home matches at Eastbourne Borough’s Priory Lane home, are yet to win a league game since winning promotion. Donnelly, who will be back in the dugout for the trip, sees the game as a great opportunity to get back to winning ways. He said: “Langney are a physical side who we’ll have to match if we are to get anything from the game.